Watch videos from the hearing further down in the article. It's soon one year since the historical Magnitsky Hearing was held in Oslo. Watch the videos from the event further down in this article. As part of the Norwegian Helsinki Committee (NHC) 40th Anniversary, the Oslo Magnitsky Hearing discussed challenges for human rights work in corrupt authoritarian states, and how democratic states can step up efforts to support and protect human rights defenders and whistle-blowers. Human rights defenders and whistle-blowers in these states are often subject to gross violations of human rights. Corrupt officials – who fear that their crimes will be exposed – are able to arrest, torture, disappear and even kill those who stand in their way with impunity. The NHC has supported human rights work in Eastern Europe and Central Asia since its start in 1977. It has cooperated on several campaigns to address the precarious situation of human rights defenders, including the Justice for Sergei Magnitsky campaign. Sergei Magnitsky was a whistle-blower that exposed extensive tax fraud in Russia and died from mistreatment in a Russian prison in 2009. The campaign, led by Bill Browder, has introduced innovative new tools in international human rights work. The Hearing was moderated by a chairing Panel, composed of distinguished Norwegian lawyers Frode Elgesem and Brynjulf Risnes, and Gro Skaaren-Fystro, Special Advisor, Transparency International, Norway. It was attended by leading experts on the Magnitsky case and on human rights work. Bill Browder, the head of the Magnitsky campaign held a key note speech. Presents discussion on the large-scale tax fraud which is at the core of the Magnitsky case, Sergei Magnitsky’s role in investigating the fraud, the arrest of Magnitsky, and the circumstances around his death in prison on 16 November 2009. The session is introduced by Bjorn Engesland, Secretary General of the Norwegian Helsinki Committee, and Bill Browder, the head of the Magnitsky Campaign. It includes a panel discussion with Olesya Shmagun, Investigative Journalist, Novaya Gazeta, Organized Crime and Corruption Reporting Project (OCCRP); Anton Pominov, Director General, Transparency International Russia; Andrei Nekrasov, Film Director; Vadim Kleiner, Head of Research, Hermitage, Justice for Sergei Magnitsky Campaign; and Valery Borschev, Chairman of the Moscow City Public Oversight Commission, member of the Moscow Helsinki Committee. Pavel Chikov, Director, Agora Human Rights Group, presents a new report on the treatment of whistle-blowers in Russia. Gunnar M. Ekelove-Slydal, Deputy Secretary General, Norwegian Helsinki Committee, discusses the definition of Magnitsky cases and why Magnitsky sanctions are needed. Simon Papashvili, Project Director, International Partnership for Human Rights (IPHR), presents a Magnitsky type case from Azerbaijan. Hugh Williamson, Director, Europe and Central Asia Division, Human Rights Watch, starts the session by presenting a Magnitsky type case from Uzbekistan. A panel of prominent human rights activists and experts discusses ways to improve protection of human rights defenders, including Magnitsky sanctions. The panel consists of Elena Servettaz, Foreign Editor, Open Russia; Sacha Koulaeva, (former) Head of the Eastern Europe-Central Asia Desk, International Federation of Human Rights (FIDH);Ilya Zaslavskiy,Research Expert, Free Russia Foundation (FRF), and an Academy Associate, Chatham House; Sonia Biserko, President, Serbian Helsinki Committee; Pavel Chikov, Head, Agora human rights group; and Petter Wille, Director, Norwegian National Human Rights Institution. Presentation of the US Magnitsky legislation by Eric Carlson, Political-Economic Counsellor, US Embassy in Norway and a panel discussion on how Norway can contribute to strengthening protection of human rights defenders and whistle-blowers? 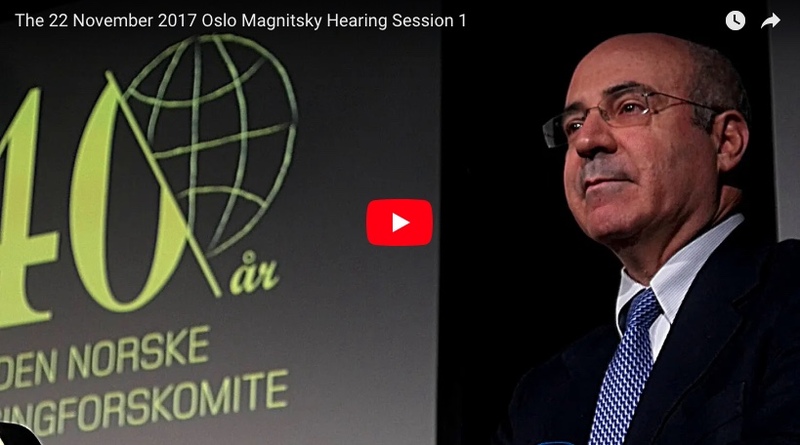 Is there a case for Norway to adopt Magnitsky legislation? The panel consists of Petter Eide, MP, Socialist Left Party; Bjørn Engesland, Secretary General, Norwegian Helsinki Committee; Bård Larsen, Advisor, Civita; Nora Sveaass, Associate Professor, University of Oslo; Member of the UN Sub-Committee on Prevention of Torture; and Beate Ekeløve-Slydal, Political Advisor, Amnesty International. The session ends with summaries of viewpoints presented at the Hearing and concluding remarks by the chairing panel, Aage Borchgrevink, Senior Advisor, Norwegian Helsinki Committee, and Gunnar M. Ekelove-Slydal, Deputy Secretary General, Norwegian Helsinki Committee. On 23 November 2017, at the Oslo Nobel Peace Centre, the Norwegian Helsinki Committee celebrated its 40th anniversary. At the same event, the 2017 Sakharov Freedom Award was presented to Deputy director Olga Sadovskaya of the Committee against Torture, and journalist of Novaya Gazeta, Elena Milashina. Anniversary greetings were presented by Olemic Thommessen, then President of the Storting (Norwegian Parliament), Ine Eriksen Søreide, Norway’s Minister of Foreign Affairs, Jonas Gahr Støre, Leader of the Labour Party, Liv Tørres, Executive Director at Nobel Peace Centre, Natalia Kaliada, Derector of Belarus Free Theater, and Valeriy Borshov, member of the Moscow Helsinki Committee, on behalf of Lyudmilla Alekseyeva, Chairwoman of the Moscow Helsinki Committee. Norwegian artist Moddi and the Russian Teatr.Doc performed; Ragnhild Astrup Tschudi, Chairperson of the Norwegian Helsinki presented the NHC Emergency Fund, and Nora Sveaas, President of NHC presented the Andrei Sakharov Freedom Award 2017. Read article "Report: Russia not a safe third country"
Read article "OSCE report confirms serious human rights violations in Chechnya"
Read article "Magnitsky Award to Ukrainian Filmmaker"